The third installment of the Cloak & Ballot trilogy clocks in at 34 pages, 1 page front cover, 1 page editorial/ToC, 1 page SRD, 1 page back cover, leaving us with 30 pages of content, so let’s take a look! Election is in full swing in Rogail – and things heat up significantly in this module. This being a review of an adventure, the following contains SPOILERS. Potential players should jump to the conclusion. All right, only GMs left? Great! After the conclusion of Part II, we begin this module with an orc mob torching the HQ of the town militia…which coincidentally also allows notorious Lem Grogh to escape from prison…and things don’t get nicer from here: A caravan fills the PCs in that orc raiders have returned and since the city was almost razed by such folk before, dispersing them may be in the interest of the campaigning PCs – this would be an optional sidequest depicted in the appendix, but it also is the end of the Lem Grogh storyline and thus should probably be played – the man has been captured and tortured by the orcs and handing him over to the authorities will get him killed…but does he deserve being set free? Nice little moral conundrum here…and yes, the PCs can prevent Grogh from being executed AND do the right thing! That being said, the PCs will probably only have the time for that if they managed to take out the gremlins before…if not Willard Maypoll will have handled the threat, which is a minor PR-fiasco for the PCs. Speaking of which: The newspaper accosts Trina Hearth, the PC’s patron, of being behind the escape of Grogh…so defusing that one’s fallout may well be rather intriguing, but boils down to relatively simple checks On the subsequent day, Trina hosts the Rogail merchant’s ball, where PCs act as security and have the chances to mix and mingle…with some presswork, they may eliminate the anti-Trina bias from the newspaper in a bit of backroom politics…oh, and they should handle those protesters, preferably before Maypoll arrives and commits a rather huge blunder, promising to get rid of the United Voice if he wins the election – you know, the very institution that is responsible for the democratic structure here. Yeah, not a smart move and one that may cost him dearly. Day 9 of the election campaign offers something I wanted to see before – a proper “Tv-duel”-style discussion, moderated and all, between Trina and Willard – with the PC’s actions and consequences mattering and some structural guidelines on how to run it. As the discussion is in full swing, it is crashed by assassins, who declare the lord-in-exile Ilin the only “proper” ruler of Rogail – the PCs will have to stop these agitators. Day 10 is election day…and here, the PCs will have to prevent fraud as well, as Willard seeks to replace the proper box with one rigged for him. No matte how the election goes, Willard will NOT go down easy and still has his militia…oh, and if he loses, he’ll do the next best thing and throw his support behind the errant lord who seeks to return. Provided the armies of Ilin are routed, he’ll retreat into the forest, where guerrilla tactics and druidic support provide a nasty advantage and slow down Rogail’s forces horribly on their way to his base camp…so the druids must be dealt with…but why are they helping Ilin in the first place? Well, turns out the lord has kidnapped the albino bear cub sacred to the order, so rescuing it from the lord will go a long way to secure their support…and when the PCs finally fall upon Ilin, it’ll be hell to pay…particularly, since he’s got a Cyclops…and Willard Maypoll will *finally* get his due as well. Oh, and guess what? Yep, Ilin’s camp if fully detailed in appendix #2. A total of no less than 4 pages of gorgeous full-color maps (yes, player-friendly) also help depicting the scenario’s respective combats. Editing and formatting are very good – while e.g. a certain magical axe sports minor rules-aesthetic glitches, that’s about the extent of complaints I can muster in that regard. Layout adheres to a beautiful 2-column full-color standard and the pdf comes fully bookmarked for your convenience. The artworks contained within are a mix of original and thematically-fitting full-color stock images – no complaints. Cartography by the esteemed Tommi Salama is as excellent as always. 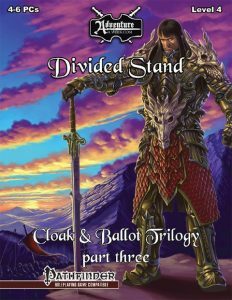 Haakon Sullivan’s and Michael Smith’s finale of the Cloak and Ballot trilogy does a lot to redeem the series in my book. After the somewhat disappointing 2nd installment, this one ends the saga with a fun and evocative bang that actually managed to captivate me beyond the level the previous installments could; to the point, where I think playing this one may justify the previous two modules. Let me elaborate: Part I and II aren’t bad modules, but their angle is so unique, I would have expected more. The idea of running an election is extremely fresh and creative and there’s a TON of stuff to do with it: I’m very interested in politics and the House of Cards-level of backstabbing and narrative potential involved with it is tremendous; there is a whole AP worth of backstabbing, unique tricks and evocative things for adventurers to do just waiting to be unleashed. The central issue of this series, then, would be that is tackles this subject – but only in a rather tangential manner. All the strategies of the PCs and their opposition, all the things you could do on any given day, are reduced to only a few things per day, when they could provide basically tables upon tables of tasks with repercussions, force the PCs to split the party to get everything done, etc. While this would have probably made the series harder to run, it also would have reflected better the chaos of elections…and allowed for a finer distinction regarding policies and the like. Providing more conflict regarding factions and their interests, actively creating the election promises and program – there is a ton of pure awesomeness you can do with the fresh and untapped subject matter. It is thus, I was left a bit disappointed by the relatively simple way that the whole election is handled – a good GM can make this a phenomenal experience, but if judged on its own, it feels rather railroady in what’s happening…and there honestly isn’t much happening at any given day. PCs will not be stretched to their limits. Ultimately, the series is the “lite” version of the whole election-drama….and much like a soda, while lite’s better than no soda at all, it also leaves this unpleasant aftertaste that leaves you craving a bit more. So that’s what I think of the whole series – and I certainly hope there’ll be a more detailed election-themed series at one point. That being said, after the railroady, uninspired 2nd part, I wasn’t looking forward to this one…and I should have. The final of the trilogy, while still too railroady for my tastes, manages to eke closer to what I wanted out of this series, with the mass combat insertion, some infiltration and the like and the TV-duel-style discussion managing to hit the right notes and provide a neat sense of diversity regarding the challenges posed. In short: It’s still railroady, but it’s significantly more fun to play. Basically, what I’m trying to say is that, if you’re a capable GM, this finale may well make running the trilogy something rather memorable for your group. It’ll take a bit of work, but in the right hands that elevate this the one step further beyond what it provides, this module and thus, the trilogy, can come to a remarkably awesome conclusion. If you’re not willing to invest time or effort in the series, then this will probably be a 4-star module and the whole saga a 3.5 star-experience for you; but if you whip out that Ultimate Intrigue and work with the series, it can transcend easily the confines of what it offers; for you, this may well be a 4.5 star or even 5 star-saga…but it can only reach this level of coolness if you do expand it. Unfortunately, as a reviewer, I can’t really rate the expansion-capacity. Instead, I have to rate what’s here…but I may, at least, take the unique premise and theme into account…which is why I arrive at a final verdict of 4 stars for this conclusion to the trilogy.